Cooking with charcoal is generally preferred over wood for several reasons: it produces more heat, burns for longer, and it’s readily available. Yet, you still can’t beat wood for flavor and wood will always be our number one choice. But whether you’re cooking on a grill or fire pit, you’ll need to stack your charcoal in the correct manner to achieve these results. Some people assume that it’s best to lay a flat and even “layer” of charcoal, but this isn’t necessarily true. To learn more about charcoal and how to create the perfect stack for grilling, keep reading. There are several ways to stack charcoal, though one of the most effective is the pyramid stack. This lives up to its namesake by mimicking the appearance of a pyramid. By creating this shape, air can flow through the charcoal more easily, intensifying the heat and overall cooking power. The pyramid stack also minimizes smoke, which is another reason why it’s preferred. Some grills come with a special charcoal stacker that you can use to create a pyramid (or near pyramid) shape. Dump your charcoal into the stacker, light the bottom, and you’re good to go! However, you don’t need this or any other item to create a pyramid stack. Regardless of the type and shape of your charcoal, you should be able to arrange it in the shape of a pyramid. With your charcoal stacked in a pyramid shape, it’s time to light it. Strike your match and carefully hold it in the center of the stack, under the pyramid. Assuming the charcoal is dry, it should light with little effort. Lightly blowing on the match — just enough to encourage airflow — can also help it ignite. If it’s not lighting, try lighting a piece of newspaper and then sticking the newspaper in the charcoal stack. Alternatively, you can use a long “grill lighter,” which are designed specifically for this purpose. Once you get the bottom of your charcoal pyramid lit, the rest should ignite. You can then sit back and wait as your charcoal heats up. Hopefully, this gives you a better understanding of how to stack charcoal for grilling. The key thing to remember is that you should create a pyramid shape for your charcoal when lighting it. 5 Common Grilling Myths Debunked or Not? There’s nothing that compares the delicious flavor or grilled food. Whether it’s a steak, hamburger, hot dog or practically any other food, there’s something about grilling that makes it taste better. However, there’s a lot of misinformation out there about grilling, some of which we’re going to debunk. One all-too-common myth is that grilling leaves food dry. When done incorrectly, it can certainly release the internal juices of pork, steaks and beef patties. However, there are ways to prevent this from happening, such as charring the outside at a high temperature or wrapping the meat in aluminum foil. On the contrary, most chefs will agree that grilled food cooked over charcoal tastes better than its gas-grilled counterpart. This is because charcoal has a unique smokey flavor that’s not achieved through gas grills. The only advantage of cooking food over a gas grill is the even distribution of heat, though you can achieve the same effects with a charcoal grill by properly stacking and igniting your charcoal prior to cooking. A third myth that many people seem to believe is that you should only flip steaks once when grilling them. Some people believe that flipping steaks and other meat too many times causes the juices to release. Assuming you cook it properly and don’t pierce the meat beforehand, though, this shouldn’t happen. Flipping meat multiple times actually allows for a more even and thorough cooking, preventing certain areas from being under-cooked and/or overcooked. Do you let your steaks sit on the counter until they reach room temperature before grilling? It’s a common assumption that doing so helps them cook faster. After all, conventional wisdom should lead you to believe that a steak at room temperature will cook faster than a cold steak. With that said, allowing your steaks to sit before cooking does only one real benefit and that is it keeps the internal part of the steak from being cold. If you like thick cut steaks rare or medium rare, which is preferred, You don’t want a nice sear with a cold inside. Too much of anything is bad for grilled steaks, and salt is no exception. But a small amount of salt, pepper and your preferred seasoning can vastly improve the flavor of a grilled steak while also helping you achieve a charred outside. We say the only spices you need if stranded are salt, pepper and cayenne. Should I Grill with Charcoal or Hardwood? If you plan on cooking food over fire, you’ll need some type of fuel. The most common fuel sources used for this purpose include hardwood and charcoal. While you can use both to cook everything from hamburgers and hot dogs to smores and vegetables we prefer real hardwood when it makes sense, but there are some stark differences between the two that you should be aware of. So, should you grill with charcoal or real hardwood? One of the biggest difference between charcoal and wood — when used for cooking — is the amount of smoke produced. Because wood contains more moisture than its charcoal counterpart, it naturally produces more smoke when burning. Some people actually prefer the rich smokey flavor of charcoal-grilled food, but others prefer the more traditional flavor of smoke-grilled food. With an average energy value of 29 MJ/kg, charcoal tends to burn hotter than wood. So, if you want to cook food in the shortest amount of time possible, it’s best to stick with charcoal. With that said, insufficient airflow and/or the absence of flames may cause inefficient heat transfer; thus, making cooking difficult. You can overcome this problem by ensuring your coals are exposed to air (grills and fire pits often have vents that you can open and close). While there are certain exceptions, charcoal is usually easier to transport than wood. If you’re going camping with some friends, you may want to carry charcoal for this reason. 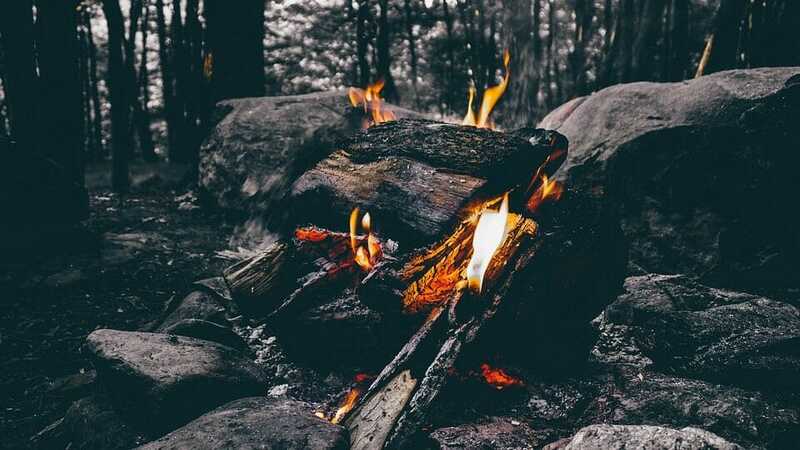 Of course, you can always scavenge native firewood at your campsite, but bringing charcoal ensures you have the necessary fuel supply for cooking, but once again we like the real wood when feasible. There’s also the issue of cost. Natural, locally sourced firewood is typically free, whereas charcoal often costs up to $10 per bag. The bottom line is that there’s no clear winner in the battle between wood and charcoal. Wood burns more slowly while releasing a distinct smokey flavor, but charcoal cooks food more quickly and easier to transport. Think about when and how you’ll be cooking and choose the fuel that’s best suited for the job. More than 100,000 wildfires burn 4-5 million acres of land every year in the United States, according to an article published by National Geographic. While lightning strikes are a common cause of wildfires, extinguished campfires are also responsible for many wildfires. So, if you’re planning to camp in the near future, you’ll want to fully extinguish and cool your campfire before leaving. Just because you see a pile of ashes left at the bottom of your fire ring doesn’t necessarily mean that your campfire has been extinguished. Ash is an excellent insulator of thermal energy, meaning it can keep embers hot enough to ignite a fire for up to 24 hours. Some people assume that their campfire is out because they see ash at the bottom, but you really need to take additional steps to ensure it’s extinguished. Hot embers buried under the ash could reignite the following day to create a wildfire. So, how do you prevent this from happening? The only “sure-fire” way to extinguish a campfire is to drown it with water. While keeping a safe distance, slowly pour water over the campfire and its embers, even if those embers are not bright red. You’ll probably hear a hissing noise when doing so, which occurs from the water’s reaction to the heat. You’ll know the fire is extinguished when the hissing noise stops. In addition to drowning your campfire with water, you should also stir it with a stick (after drowning it with water). The purpose of this is to ensure the water has penetrated all layers of the fire. If there’s still a hot later, you may hear the hissing noise again when stirring the fire with a stick. When possible, use an existing fire ring to build your campfire instead of creating a new one. Only burn wood in your campfire, not trash or debris. Keep water nearby in case your campfire burns uncontrollably. Consider the direction in which the wind is blowing when choosing a location for your campfire. When camping in parks, check to see if there’s a fire ban in place or other restrictions for creating campfires. With internal temperatures reaching up to 500 degrees Fahrenheit, fire pits create more than enough heat to burn the skin. The good news is that burns are rare, especially safety precautions are taken. So, what steps can you take to prevent burns when using a fire a pit? Never touch the outside of a fire pit while a fire is burning is inside. 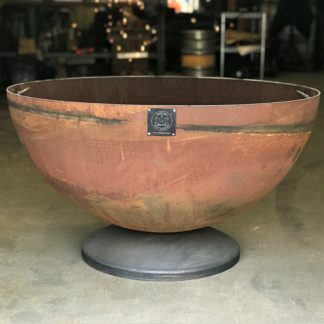 Most fire pits are made of steel, and while steel lacks the heat conductive properties of aluminum, brass and copper, it still transfers some heat. If you accidentally touch the outside of your fire pit while it’s being used, you could end up with a burn. The bottom line is that you should touch your fire pit until the inside has thoroughly cooled and is no longer hot. Another safety tip I’ve learned over the years is to wear heat-resistant gloves when cooking. This isn’t limited strictly to fire pits; this tip applies to all forms of outdoor cooking, including grills, open-flame campfires and more. When cooking outdoors, wearing a pair of heat-resistant gloves will allow you to move food on/off the grill without getting burned in the process. Avoid the temptation to burn leaves, trash, yard debris and other non-wood items. Fire pits are designed specifically for burning wood, and tossing other items into it could send fiery debris into the sky; thus, increasing the risk of burns. As long as you only burn wood in your fire pit, you’ll promote a safe environment while lowering the risk of injury. Standing only a few inches away from an active fire pit is a good way to get burned. Just turning your body the wrong way could result in a nasty burn, which is why it’s a good idea to get your distance. Just because the fire has burned down to ash doesn’t necessarily mean that it’s cool. On the contrary, ash can remain hot enough to cause burns — or to spark another fire — for up to 24 hours. Therefore, you should wait until at least 24 hours after your fire has been extinguished before attempting to move the ash. Ask any seasoned camper and he or she will agree: food just taste better when you’re miles away from civilization. From basic snacks to full meals, there’s something special about eating when camping. With that said, there are several different ways to cook using a campfire, some of which we’re going to explore in today’s blog post. One of the easiest ways to cook using a campfire is to skewer the food on a stick. Whether it’s marshmallows, steak medallions, vegetables, etc., most small-sized food can easily be skewered and cook over a campfire. And with the food on a stick, you can easily raise or lower the height to adjust its cooking temperature. The only real problem with this method is that it may or may not cook food evenly throughout. Another idea is to cook food over a campfire using aluminum foil. The aluminum foil acts as a protective barrier, keeping its contents clean and preventing it from burning. However, it still allows for the transfer of heat so the food will cook. Simply wrap your desired food in aluminum foil, after which you can place it either directly on the fire or on a grill grate. Because the food is contained in aluminum foil, you can cook smaller pieces than using the skewer-stick method mentioned above. You can also place the foil-wrapped food directly over the fire, allowing for a more even and thorough cooking. Of course, a third option — and probably the most popular — is to cook food on a grill grate over a campfire. You don’t have to necessarily bring an entire grill (although some campers do). Rather, bring a metal grille grate to place over your campfire. Once your campfire reaches a hot enough temperature, you can cook on the grate like a normal grill. The only downside is that your fire must be small enough so it doesn’t burn your food, which is a very real possibility when using a grill grate. Many campers prefer this method because it leaves the distinct grill marks of a traditional grill. If you want to cook steaks, for instance, using a grill grate creates the characteristic lines. Regardless of which method you choose, be sure to clean up afterwards. Nearly one-quarter of all new homes constructed in 2014 had a deck, according to the Survey of Construction conducted by the U.S. Census Bureau. A wooden deck is a valuable addition to any home. It provides homeowners with a communal area where friends and family members can gather, and statistics show that it even adds monetary value to homes. But if you plan to use a fire pit on your wooden deck, there are a few things you should know. Conventional wisdom should lead you to believe that a wooden deck isn’t fireproof; therefore, you’ll need take some precautions when using a fire pit here. The good news, however, is that you can safely use a fire pit on a wooden deck, but only if you follow these safety measures. When choosing a location to place your fire pit, a good rule of thumb is to keep it at least 10 feet away from your home. Whether it’s on a wooden deck, stone patio or elsewhere, follow the 10-foot rule. Doing so reduces the risk of serious property damage and injury. Never use lighter fluid, gasoline or any other flammable liquid in your fire pit. If you accidentally spill any of these liquids on your wooden deck, it could easily ignite and catch fire. If you’re having trouble starting a fire, place additional tinder in the center of the wood or coals. Once this ignites, the heat should catch the wood or coals on fire. In addition to keeping your fire pit at least 10 feet away from your house, you should also place it on a flat, surface. Assuming your wooden deck was built properly, it should be level (or almost level). Nonetheless, it’s a good idea to double-check and make sure the surface is level before using your fire pit. It’s also a good idea to place some type of fire-resistant barrier between your fire pit and wooden deck. A small square-shaped grid of stone pavers, for instance, will protect your wooden deck from the fire pit. While a fire pit typically won’t produce enough heat to ignite a deck, this will protect your deck from heat stains and scorching. Wouldn’t it be great if there was an abundance of dry, perfectly-stacked firewood waiting for you in the woods of favorite campsite? Building a campfire is an essential part of camping. It provides warmth, light, cooking fuel, and a social-friendly place for campers to gather around. But you’ll need dry, not wet, firewood to build a campfire. If the ground is wet from rain or snow, you may have trouble locating dry firewood. To begin your search for dry firewood, head for the forest canopy, paying close attention to the area around the base of trees where it’s sheltered by the canopy. Some rainfall will inevitably break through the canopy and hit the ground. Assuming the canopy is thick and dense, however, it should block out most of the rain, keeping any stray branches and firewood dry underneath. Many survivalists and wilderness experts also recommend looking for dry firewood around fallen trunks. When large trunks fall, they’ll often remain propped up against a nearby tree, protecting them from rot. You can easily harvest these trunks for use in your campfire. Just remember to look for snakes and other critters that could be lurking underneath. Using nothing more than a knife, you can often harvest dry firewood from wet wood. Basically, this involves splitting a medium-sized piece of firewood down the middle and shaving off large, thin pieces of the dry material from the center. To split a piece of firewood, place the blade of your knife against one end and use a separate piece of wood to “hammer” it down. When done correctly, the wood should split, revealing the center. With the center exposed, you can shave dry pieces of wood for use in your campfire. These pieces will likely be small, however, so don’t expect to build a raging bonfire. Of course, you can always bring your own firewood from home instead. Assuming you aren’t hiking several miles into the deep wilderness, you can probably pack enough firewood for at least one night. And if you’re worried about it getting wet, place it a large waterproof plastic bag for added protection. No, you don’t have to rub two sticks together to build a fire without a match. An easier and more effective “primitive” fire-building solution involves the use of flint and steel. Available for sale at most camping and outdoor sporting goods stores, people have been using flint and steel to build campfires for centuries. Striking flint against steel results in small pieces of steel being scraped off at high temperatures. These embers are then used to ignite kindling and tinder, after which you can begin adding larger pieces of wood to your fire. Don’t assume that all flint-and-steel combos are of equal quality. Some of the cheaper combos contain low-quality flint, which is harder to create hot embers from. The flint should have a sharp edge, which is used to strike against the steel, and it should be large enough to comfortably hold in your hand. Also, it doesn’t necessarily have to be flint. Alternatives such as agate, jade, quartz, and chert are all excellent choices, assuming they have about a 7 or 9 on the Mohs hardness scale. After collecting a decent amount of kindling and tinder, it’s time to build your campfire using flint and steel. To begin, place some small kindling in a teepee shape, leaving the bottom open (this is where tinder is place once ignited). Gather up a small pile of tinder and place it over the top. While holding the steel in one hand, strike the flint downwards onto the surface of the steel at a 30-degree angle. Ideally, you should use the sharp edge of the flint to peel small pieces off the steel. As the small pieces come off, they’ll land on the tinder, hopefully igniting it. And once the tinder is ignited, you should quickly pick it up and move it underneath your pile of tinder. Congratulations, you’ve just a built a fire using flint and steel! Of course, you’ll want to keep your flint and steel dry when camping. If either the flint or steel becomes wet, it may have trouble creating hot embers — hot enough to ignite your tinder and kindling. Some campers place their flint and steel in a sealed plastic bag to keep them dry. 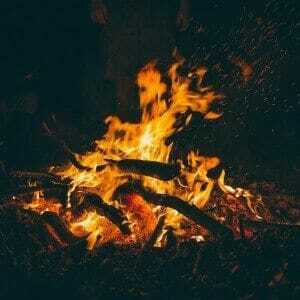 What is a ‘Leave No Trace’ Fire? If you’re an avid outdoorsman who enjoys camping, you may have heard of a “leave no trace” campfire. Campfires are an essential part of camping. They provide warmth, light, heat for cooking, and even a social-friendly environment. So, what is a leave no trace campfire? The fundamental principle behind a leave no trace campfire is to, well, leave no trace. Campfires typically leave behind some evidence of a fire, such as ashes and leftover/unused firewood. If you want to create a leave no trace campfire, though, you should strive to eliminate evidence such as this. There are several ways to create a “minimum impact” fire, each of which has its own advantages and disadvantages. A mound fire, for instance, is a type of campfire that’s built from a mount of mineral soil (soil containing mostly minerals instead of organic matter) over a fire blanket. Mound fires should be at least 6″ tall and 12-24″ long. After creating the mound of soil, you should form a depression in the center, which is where the actual fire will burn. Mineral soil can be collected from root bulbs. An alternative to a mound fire is a fire pan. Although it looks like an ordinary frying pan, fire pans are used specifically for building fires. They are used to minimize impact of campfires on the ground, vegetation and environment. A fire pan allows for quick and easy burning, reducing firewood and paper waste to ash, which is contained atop the pan. To use a fire pan, you should place several rocks on the desired area so the heat doesn’t scorch the ground underneath. Next, place the firewood inside the pan and ignite. Fire pans are often preferred when camping because they can be picked up and transported. If you’re in a bind and don’t have access to an actual fire pan, however, you can always use a traditional cooking pan. Once you’ve made your way to the campsite and set up a tent, it’s time to begin collecting firewood. Getting some initial firewood now means you won’t have to try and find it when the sun goes down. But not all wood is suitable for use in a campfire. Some varieties burn more efficiently than others, which is why it’s important to familiarize yourself with the different types. The drier the wood, the hotter and more easily it burns. Therefore, you should avoid picking up wet or damp wood, and instead focus your efforts on wood that “snaps.” If it recently rained, you may have to search for some dry wood. Check under downed trees, against ridges, under debris, etc. There are dozens of different tree varieties in North America, though one of the best for use in a campfire is oak. It’s highly dense, meaning it will burn for a long time once ignited. The only problem with oak is getting it lit. Because of its dense structure, it takes a really hot flame to ignite oak firewood. So, if you’re having trouble getting it lit, consider placing some less-dense firewood underneath and/or using more kindling. Once lit, oak will burn well into the night and possibly the morning. Another excellent type of firewood for a campfire is maple. It’s classified as a deciduous hardwood species, and like oak, maple is also a dense and hot-burning wood. Maple also produces little smoke, making it an excellent choice for social settings such as bonfires where smoke can otherwise be a problem. If the wood is rotted, it’s best to steer clear and choose different firewood for your campfire. Not only does it contain a higher moisture content, but it’s also less dense, meaning it won’t burn as long. Furthermore, rotted wood produces more smoke, which is something you should try to avoid. When collecting firewood, pick up small twigs and branches to use when initially lighting your campfire. You can still use tinder and kindling, but you’ll probably need smaller pieces of actual firewood to get it going. But once the fire is going, you can add larger pieces of wood on top, which should keep it burning. Pork tenderloin is a juicy, delicious meal that’s surprisingly easy to make. However, there’s a wrong way and a right way to grill a pork tenderloin. Unfortunately, many home chefs approach it the wrong way, resulting in dryness while reducing its flavorful taste. If you’re struggling to grill the perfect pork tenderloin, keep reading for some helpful tips. Pork tenderloin is best grilled at low heat, so you need to prepare your grill or fire pit accordingly. Rather than stacking a hot pile of coals in the center, consider placing a thinner layer of coals on the bottom-most rack. This creates more space between the coals and the pork tenderloin, allowing it to cook more slowly and at a lower heat. Alternatively, you can use wood chips, which typically produce less heat than coal. To prepare your pork tenderloin for grilling, you’ll need to either season or marinate it. A marinade consisting of olive oil, salt, ground black pepper, garlic and oregano is an excellent combination. Combine the aforementioned ingredients in a bowl, place it in a sealed plastic bag, and add your pork. Allow it to soak for at least two hours, after which the pork should be ready to grill. Because of its natural juiciness, though, pork tenderloin really doesn’t need much help in terms of seasoning. If you don’t want to mess with a marinade, you can sprinkle some salt and pepper on it. After marinating and/or seasoning your pork tenderloin, you should wrap it in aluminum foil. This works to keep the juices locked into the tenderloin, preventing it from becoming dry. Now it’s time to grill your pork tenderloin. Assuming the coals are mostly white, go ahead and place the pork (wrapped in aluminum foil) on the center of the rack. The time it takes to grill pork tenderloin varies depending on the heat of your grill and the size of the pork. With that said, a good rule of thumb is to grill it for roughly 12-14 minutes, flipping it once halfway through. When your pork tenderloin is finished grilling, use a meat thermometer to check the temperature, which should read at least 140 degrees Fahrenheit. As long as the internal temperature reaches this amount, it’s good to go! However, you should let the pork tenderloin sit for 10 minutes so the juices will settle. A campfire provides campers with warmth, light, relaxation, and a place to safely cook food. Mankind has been building them for thousands of years, and even today there’s no substitution for a genuine fire. However, you might be surprised to learn some of the following facts about campfires. While temperatures vary depending on many factors (e.g. type of wood, airflow, quantity of wood, how long it’s been burning, etc. ), it’s not uncommon for a campfire to reach 930 degrees Fahrenheit. Due to its high heat, safety precautions should be taken around campfires to avoid injury. A campfire can be constructed in one of several ways, some of which include the tipi, lean-to, log cabin, hybrid, keyhole and many others. The tipi is a popular choice, as it’s easy to build and provides ample, consistent warmth. It’s created by piling the tinder in the middle with smaller kindling around it, similar to the poles of a tipi. Even if the wood from your campfire is no longer burning, the ash and coals may continue to burn — even if they are buried under dirt. The hot coals continue to smolder long after the fire goes out. And if they are near a tree root, they can ignite and spark a new fire. It’s unknown who was responsible for building the world’s first campfire. Historians, however, have found evidence indicating that early man built them around 1.6 million years. This evidence was found in the form of burned antelope bones in remote caves of South Africa. Many national parks have rules regarding campfires. Most State Parks and National Parks allow campers to collect and use any firewood that’s lying on the ground. If the park has an erosion problem, however, it may prohibit the collection of firewood. If you’re having trouble igniting a campfire with traditional firewood, perhaps you should look for fatwood. Also known as fat lighter, lighter wood and rich lighter, fatwood is derived from pine heartwood. Over time, the resin within pine becomes hard, making the wood resistant to rot and decay. It lights quickly and easily, even in wet and/or windy conditions. Fatwood also burns hot enough to ignite other, non-fatwood firewood that’s nearly. 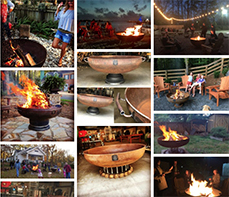 Looking for a new fire pit? Humans have used natural and man-made structures to contain their fires for centuries. Even today, fire pits remain one of the popular trends in outdoor living, according to a recent landscaping study. But there are a few things to consider when buying a fire pit. You should consider when and how the fire pit will be used, as some models are better suited for certain applications than others. If you want to take your fire pit camping or tailgating, for instance, you should choose a portable style that’s easy to carry. 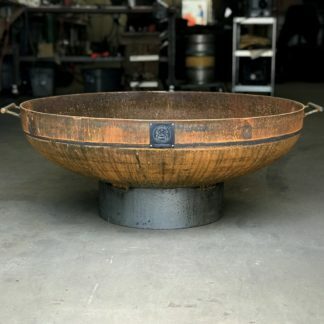 What material or materials is the fire pit made of? Steel is an excellent choice given its unique combination of properties that simply aren’t found elsewhere. Steel fire pits are safe, lightweight, easy to clean, look great, strong/durable and radiate a significant amount of heat. Some homeowners prefer the look of stone fire pits, but unlike steel, stone is susceptible to damage such as cracking and chipping. Furthermore, stone fire pits weight significantly more than steel, are not portable and don’t put off much radiant heat. Where was the fire pit manufactured? If it was manufactured overseas, it may contain toxins and dangerous materials. Furthermore, customers who encounter a problem with these overseas fire pit may struggle to get a response by the company. This is why it’s recommended to choose a fire pit made here in the United States, such as those offered by S&S Fire Pits. If you plan to cook on your fire pit, you should choose a model with a flat rectangular or square grilling grate. A great that covers the entire cooking surface means you have to lift the entire grate off of it when you need to add some fuel. 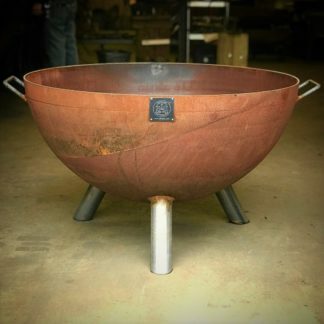 Using this type of fire pit, you can grill burgers, steaks, hot dogs, pork chops, chicken, vegetables or pretty much whatever else your heart stomach desires. Arguably, one of the most important things to consider when choosing a fire pit is the style. A good fire pit should posses a unique rustic appearance, enhancing your home’s exterior. Avoid cheap, run-of-the-mill fire pits and choose a stylish model instead. Of course, you’ll probably want to consider the cost when shopping for a new fire pit. Some models can easily run you well over $1,000. Price, however, isn’t always an indication of quality. Here at S&S Fire Pit, we offer some of the finest-quality hand-crafted fire pits on the market, all for sale at affordable prices. Enjoyed by roughly 83% of the United States adult population, coffee is one of the world’s most popular beverages. But if you plan on going camping, you probably won’t have the luxury of using a slow-drip coffeemaker. Nonetheless, there are still ways to brew a delicious cup of Joe, which we’re going to explore in today’s blog post. Campers have been using percolators to make coffee for decades. Consisting of a tall pot with a small chamber for holding the ground beans, it’s a great way to make delicious coffee while camping. To use a percolator, fill the main chamber with water and then place the coffee grounds into the small holding chamber. A good rule of thumb is to use roughly 1 tablespoon of coffee grounds per cup of water. If you’re making two cups of coffee, try using two tablespoons of coffee grounds. However, if you prefer stronger coffee with more “kick,” you can always add more. After adding the water and ground coffee to your percolator, place it over your campfire and bring to a low boil. You can usually tell when it’s boiling by listening, as the water should create a “roaring” sound. Once the water comes to a boil, move the percolator off to the side where it’s exposed to less heat. Allow it to simmer under this low heat for 5-10 minutes, after which you can pour the coffee and enjoy! Another method used to make coffee while camping involves a special pot known as a French press. It’s often preferred over the percolator because of its ability to brew large amounts of coffee. To use a French press, place the ground coffee in the main chamber, add boiling water, and allow it to steep for 4-6 minutes. Next, gently press on the plunger so it pushes the ground coffee to the bottom. You can then serve and enjoy! Of course, an alternative method is to use instant coffee. You can buy boxes/packets of “instant coffee” at most grocery stores and supermarkets. To use them, simply bring a pot of water to a boil, carefully pour a cup’s worth of boiling water into a mug, stir in the instant coffee, and enjoy! While easier, many people prefer the more authentic taste of coffee that’s been brewed more slowly. Did you know that campfires are one of the most common reasons for forest fires, as well as injury to campers? Whether you’re camping in the mountains, on the coast, in the forest or elsewhere, you’ll probably want to build a fire. Campfires offer more than just warmth and cooking fuel: they boost morale while promoting greater social interaction in the process. But if you plan on building a campfire, you should follow these tips to reduce the risk of injury. If there are no existing fire rings available at your preferred campsite, create your own with a circle of small-to-mid-sized rocks. This helps to contain the fire, preventing it from escaping and igniting nearby trees and plants. What’s wrong with wearing nylon clothes, accessories or gear when building a campfire? Well, this synthetic fabric is highly flammable, and exposure to a stray ember could set it ablaze. There have been countless cases of campers sustaining serious burns simply by wearing nylon near a fire. Only wear fitted, non-flammable clothing around a campfire. You should also consider wind direction when building campfires. Strong winds can send flaming-hot embers flying across the landscape, igniting nearby materials. A good rule of thumb is to build your campfire against a non-flammable wind block, such as a ridge. If the winds get too bad, you can rest assured knowing that your campfire is safely contained and won’t spark a wildfire. I know this probably sounds like common sense, but it’s still worth mentioning that you should never touch hot embers. Even if the embers “look” cool, they could still be holding more than enough heat to leave serious burns. Before leaving your campsite, pour a small amount of water over the embers to safely extinguish them. Don’t burn cedar, pine or other non-soft wood in your campfire. These woods are more likely to pop, which could send a hot ember shooting towards you or other campers. Choose dry hardwood to burn in your campfire. And when adding it to your campfire, gently place it on top. Throwing firewood into a burning campfire could result in injury, as embers may shoot up into the air. Fire pits require some type of fuel to operate, with the most common sources of fuel being liquid propane or wood. Assuming you choose the latter, you should follow the tips outlined below. It’s important to burn the right type of wood in your fire pit. A good rule of thumb is to only burn dry, native firewood in your fire pit. Avoid burning pressure-treated wood or lumber, which often contains harsh and otherwise dangerous chemicals. Even if a piece of wood “looks” natural, it may contain chemicals to discourage rot — chemicals that are released into the environment when burned. The bottom line is that you should only burn dry, natural firewood in your fire pit. Ashes can retain enough heat to ignite paper, grass, and other flammable materials well over 24 hours after the fire has gone out. So even if your fire pit looks and feels cool, the ashes could pose a serious fire hazard. To reduce the risk of a fire, wait until your ashes have completely cooled before dumping them. And when you’re ready to dump them, dump the ashes in a metal bucket and NOT the trash can. Try to get into the habit of covering your fire pit when it’s not being used. Leaving your fire pit exposed to the elements may cause rain to fill inside, which can mix with your ashes to create a mess. This shouldn’t cause any lasting damage, but it’s still something that most consumers want to avoid. Covering your fire pit prevents this from happening while keeping it nice and dry. When choosing a location for your fire pit, make sure it’s away from your house, trees, overhanging branches, and other flammable materials. And don’t leave your fire pit burning unattended. Instead of disposing of your fire pit’s ashes, you may want to use them for other purposes. 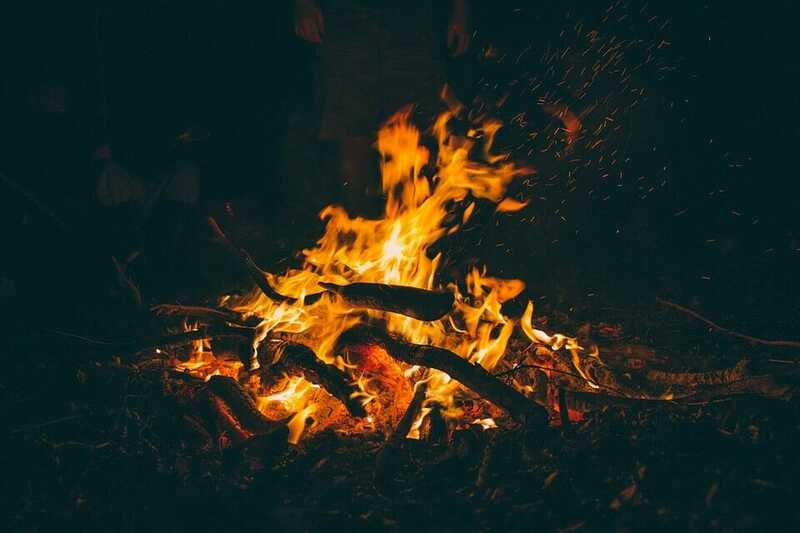 We talk about common uses for fire pit ashes in a previous blog post, which includes odor eliminator, stain remover, garden compost, insect repellent, wine sediment remover, and more. Whether you plan on using it for one of these purposes or not, though, make sure the ashes are cool before moving them. Whether you live in Pennsylvania or not, you can enjoy a delicious Pittsburgh-style steak grilled on your backyard fire pit. The term “Pittsburgh-style” refers to a specific grilling method in which the outside of the steak is charred while the inside remains rare or medium-rare. The outside is exposed to a hot flame, essentially searing it without cooking up the inside. What’s the big deal surrounding Pittsburgh steaks? Well, let’s first take a few steps back to reveal the characteristics of this steak. It’s unknown who exactly invented the Pittsburgh-style steak, although reports indicate that it originated out of the steel mills in the city from which it was named. Mill workers needed a filling, high-calorie meal, but they typically only had half-an-hour for lunch. Being that they had access to blast furnaces, however, they came up with the idea of searing the steak on the outside while leaving the inside rare. A Pittsburgh-style steak can be cooked in many different ways. Back then, they were cooked on blast furnaces, which reach temperatures of more than 2,000 degrees Fahrenheit. Today, however, most people prefer to cook their Pittsburgh-style steaks on a traditional open-flame grill. This offers a delicious smokey flavor, along with the high heat needed for this unique cooking method. Pittsburgh-style steaks are particularly delicious because of their juiciness. By searing the outside, it locks in the steak’s juices. So when you sit down at the table and cut into your steak, you’ll be treated with an ultra-juicy steak that’s loaded with flavor. Season the outside of the steak heavily with your preferred blackening seasoning. This not only provides more flavor, but it also helps to sear the outside. Get your fire pit or grill as HOT as possible by using a decent amount of firewood. Wait at least 7-10 minutes before placing the steak on the grill, as this heats up the grate. Place your steak on the hottest part of the grill, which is usually the very center. A good rule of thumb is to cook a 1-inch-thick steak for roughly 3-4 minutes per side for Pittsburgh-style. After cooking your steak, remove it from the grill and let it sit for 2 minutes before consuming. This allows the juice to settle, creating even more flavor. Wouldn’t it be great if you had clear and sunny skies every time you went camping? Sure it would! But unfortunately mother nature doesn’t always go this way. While rainfall varies from state to state, most regions in the United States receive “measurable precipitation” 155 days per year. It’s hard to fully enjoy a camping trip when it rains. The rainfall can force you campers to stay in their tents while putting out their campfires in the process. There’s no way to control mother nature, but you can follow some simple steps when building and maintaining your campfire to keep it burning in the rain. Here’s how you do it. Building a rainproof campfire begins with choosing the right location. Ideally, you should build your campfire in a location that’s guarded from the rain. The base of an overhanging ridge, for instance, is an excellent choice. The ridge should shield some, if not all, of the rain from reaching your campfire. The ground should also be dry or semi-dry. Of course, this isn’t always an option. If you are camping in a state park or wildlife refuge, there may be laws requiring campers to build fires in existing fire rings. If you are unable to build a campfire in a “dry” location, create a cover over the campfire using wood and branches. Just remember to build this cover high enough so it doesn’t catch flame. Getting a campfire started in the rain an be tedious and time-consuming process. If you have a dry area, however, you should be able to start it with relative ease using dry kindling and tinder. Pocket lint, for instance, will ignite in no time at all. You’ll also need plenty of dry fuel to keep your campfire going in the rain. This is where many campers mess up, as they struggle to find adequate fuel for their fire. Tree bark, particularly that from birch trees, is an excellent source of fuel. It contains natural oils that repel moisture, so it may burn even if it’s semi-moist. You can strip wood from other types of trees to use in your campfire as well. If the bark is saturated with moisture, use a knife to strip a thin layer from the outside and always keep a tarp over your wood to help keep it dry.